Doze off in a snow hotel in Kirkenes, go star hunting in Trysil, or enjoy a candlelight dinner at a lighthouse in Lofoten. There are many ways to explore Norway with your loved one. Winter in Norway offers adventurous days and dark nights. And there are some places where the romantic vibe is more powerful than others, both in big cities and on hidden islands. Odd Roar Lange has explored many of these destinations during his journeys all over Norway. 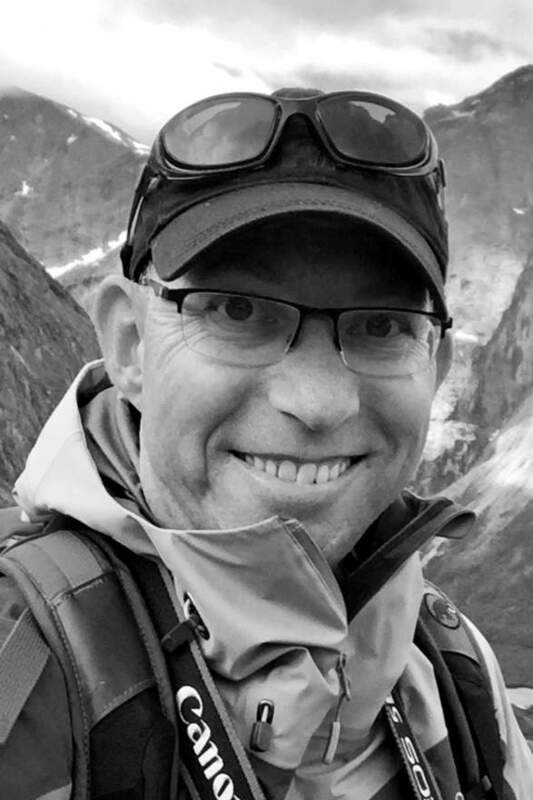 He is a widely travelled journalist and the founder of The Travel Inspector, one of the most powerful blogs of its kind in the Nordic countries. Here, Odd Roar Lange has picked seven getaways that will captivate you during your winter break in Norway. This is your ticket to those special moments you and your loved one will talk about in the years to come.
. The core of this hotel is snow and ice, elements that are an important part of everyday life for the inhabitants in Finnmark. But even though the temperature inside is only -4 degrees, the comfy beds with reindeer hides will keep you and your partner warm. "Here, you can go dog sledding during the day, take a sauna before dinner at Gabba Restaurant, and end the day looking at the northern lights", Lange says. But even though the temperature inside is only 25 degrees, the comfy beds with reindeer hides will keep you and your partner warm. Top-class restaurants, cosy streets, and snowy nature within short distance. Oslo has a lot to offer during winter. And if you really want to warm things up with your partner, book your own sauna for the evening at SALT and take part in a ritual that is deeply rooted in the Nordic lifestyle. SALT is a nomadic art project currently situated along Oslo’s harbour promenade and overlooking the capital’s Opera House. In addition to a private sauna experience, SALT offers fresh food, concerts, and festivals. “It is simply just a romantic experience in the middle of Oslo”, Lange promises. Escape your everyday life and walk hand-in-hand into the cold, dark wilderness in Trysil. Here, far from both the village and your wooden cabin, you can experience a starry sky that is so bright, it lightens up the snow under your feet. Romantic, right? This scenic holiday spot close to the Swedish border is known for its clear sky, and stargazing tours are actually a thing here. 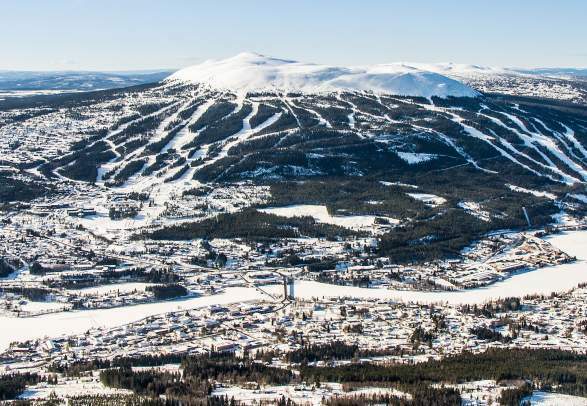 “If you are really lucky, you might even witness the northern lights”, Lange says, and also points out that Trysil is Norways largest ski destination. That means slick slopes and groomed trails, several eateries serving local food, and hotels that suit your budget. 1. Don’t drink too much alcohol. 2. Make a travel budget you both agree on. 3. Turn off your phones and do things together. 4. Be responsible – and take initiative. 5. Don’t be alone all the time – get to know other people. Find a map and slide your finger from Northern Norway and towards the North Pole. Do you see the group of islands halfway across the Arctic Ocean? That’s the Svalbard Islands – a haven for adventurous couples. Here, you will experience rich wildlife, Arctic nature, and old mining towns with a stark and eerie beauty. “A romantic getaway to Svalbard and the town Longyearbyen is something you’ll never forget”, Lange says. He recommends a stay at Basecamp Hotel, where you can enjoy an informal atmosphere and rooms decorated with driftwood, sealskin, and slate. The hotel is located in the middle of Longyearbyen and close to the restaurant Huset, an eatery that isn’t just known for its exquisite flavours – the restaurant takes your date night to the next level with one of the largest wine cellars in Scandinavia. The white wilderness at Svalbard also offers lots of adventurous activities such as dog sledding and northern lights safaris. Maybe you will spot a polar bear from a distance? Just remember that if you do, never ever try to approach it. is one of those places. This is an authentic fishing village in Lofoten with less than 200 inhabitants. In other words, you and your partner may find time to be completely alone whilst enjoying the stunning surroundings. “A walk on Kjærlighetsstien (literally ‘The path of love’) is a must during your stay at this island. It’s also possible to book a room at Skrova lighthouse”, says Lange. 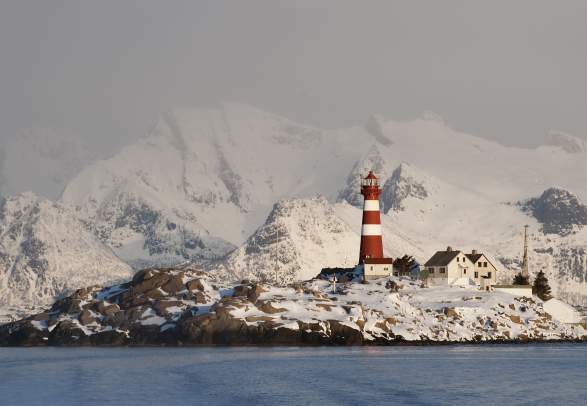 Here, on the tip of the island, you’ll find a lighthouse standing 24,5 metre tall and surrounded by white, wooden houses that forms a small village. Today, the lighthouse offers more than just guidance for the local fishermen. It welcomes travellers from all over the world who want to experience a vacation out of the ordinary. Here, on the tip of the island, you’ll find a lighthouse standing 80 feet tall and surrounded by white, wooden houses that forms a small village. Today, the lighthouse offers more than just guidance for the local fishermen. It welcomes travellers from all over the world who want to experience a vacation out of the ordinary. This coastal town in Southern Norway is famous for being one the best places to experience the Norwegian summer vibe. However, Lillesand is a great place to get lost for a few days in the wintertime as well. Dress warmly and take a relaxing walk in the town centre, along the narrow streets that curves elegantly between white wooden houses. Or find a rock along the scenic coastal line and share a blanket and something warm to drink whilst enjoying each other and the view. Lange recommends that you end the day with a romantic dinner and a night at the charming Lillesand Hotel, which is situated close to the town centre. Surrounded by steep mountains and wooden houses with snowy roofs, Kvitfjell looks like a scenery from a Norwegian folk tale. Here in the middle of the Gudbrandsdalen valley, you will find everything you need for a weekend with your loved one by your side. Gudbrandsgard Hotel is popular amongst couples and is situated just a short walk from groomed trails and a top-class ski resort. “This is a place where you can enjoy fresh food, spa facilities, and an evening in front of the fireplace”, Lange says. Check out and read more about romantic getaways in Norway. In this map, Odd Roar Lange has added even more options for you and your loved one. Looking for a romantic getaway? Here is a list of places to visit for a different kind of holiday.